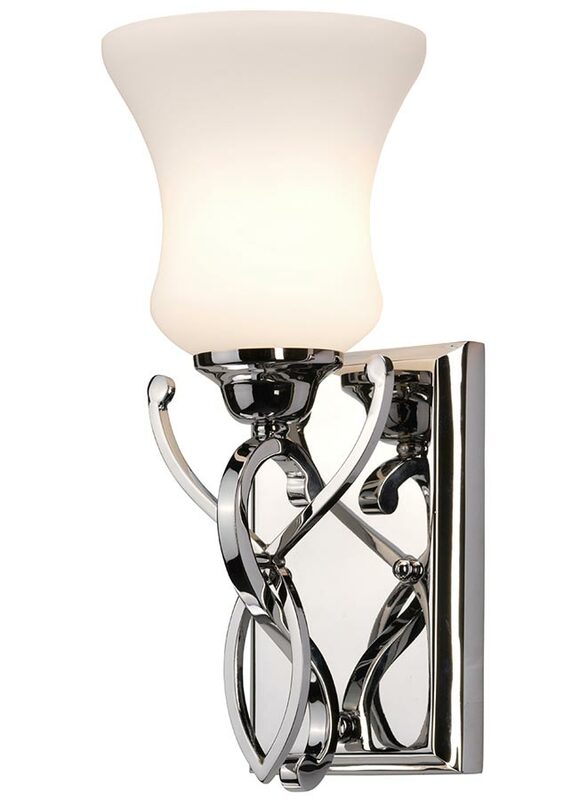 This Hinkley Brooke 1 light bathroom wall light in polished chrome with etched opal white glass shade is rated IP44 and features an updated traditional look. Boasting a stepped rectangular wall mount, double scroll arm and crossover metalwork detail in bright chrome. A spun fitter supports an upward facing etched glass goblet shade. Specifically designed for use in bathrooms but can be used anywhere inside your home except wet rooms. The Brooke’s updated traditional look features minimalist forged scroll design in polished chrome that elegantly complements its etched opal glass, making it the perfect complement to any bathroom. If you are searching for a quality wall light to complement your bathroom, the Brooke is certainly one to consider. The sleek lines are suitable for a contemporary setting, whilst the updated traditional style makes it suitable for classic and period bathrooms too. Supplied with an energy efficient LED lamp, rated IP44, fully splash proof and suitable for bathroom zones 1 and 2. There is a matching over mirror light available that can be viewed below. This bathroom light is supplied by Elstead Lighting and designed in the USA by Hinkley, founded in 1922 in Cleveland, Ohio. They have transformed from a small outdoor lantern company to a global brand intent on bringing you the best in style, quality and value designs like the Brooke 1 light bathroom wall light in polished chrome with etched opal white glass shade and rated IP44 featured here.